If you’ve ever ridden your bike on city streets, you’ve surely experienced the desire to inflict some pain on cars and their rather absent-minded — or plain vicious — drivers. Well, now you can! (Not that Inhabitat endorses violence or destruction of property in any way.) Meet the monster truck of the bike world, the aptly named BigDog — a 600-pound four-person “bike” that can roll right over a car. 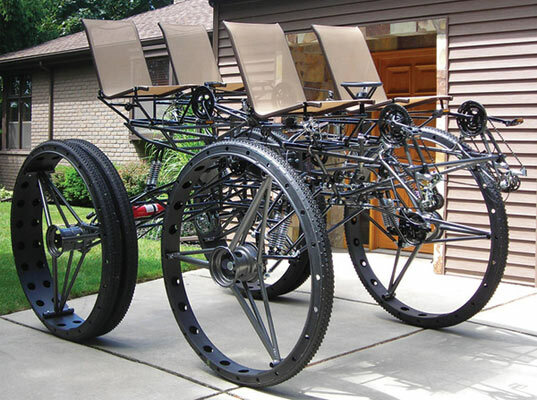 Tom Wilson made the crusher from bicycle, go-cart and golf-cart parts and will be presenting it at Detroit’s Maker Faire at the end of this month. Most boring video ever. What\'s with the text that says you \'can roll right over a car\' then has four rich ponces cruising around one of the most afluent suburbs I have ever seen and not rolling over a car? Boaring! If you've ever ridden your bike on city streets, you've surely experienced the desire to inflict some pain on cars and their rather absent-minded — or plain vicious — drivers. Well, now you can! (Not that Inhabitat endorses violence or destruction of property in any way.) Meet the monster truck of the bike world, the aptly named BigDog -- a 600-pound four-person "bike" that can roll right over a car.